I love these, but why can't I find them in GC's ? Waddy try Slack Top Nursery. They have a website and are open on some days of the week. They do stock hepaticas. Waterloo House Slack Top, Hebden Bridge HX7 7HA. Gorgeous colour and so dainty. I didn't know about this place Scotsgran I'll give it a try. Thank you! I hope you find what you want. There is an Alpine Garden Society branch in your county. I dk how close it is but they do not cost a fortune to become a member and they offer regular meetings and speakers which might be of interest for you. They also have shows where you will find traders of plants often shown on here as alpines. Bjs I dk what happened to my reply here. 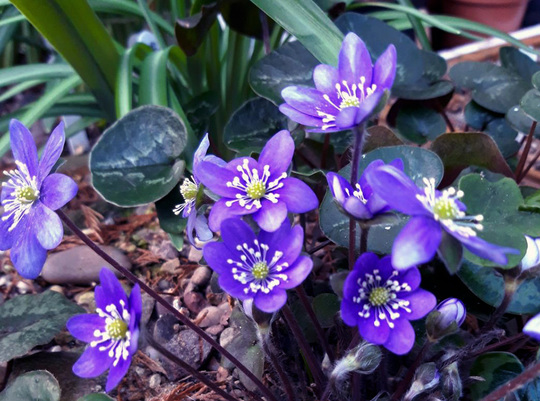 I think this is the cobalt blue hepatica and it is gorgeous. Mine are not showing buds yet. Thank you Scotsgran, I'll look into that too.